Though the last quarter of 2013 has brought about a change in my employment, from the Edwardsville Intelligencer newspaper to the downtown St.Louis ad agency of Response Targeted Marketing as a web designer, my very active effort to build my photographic portfolio has only increased. I have recently begun a large photographic project on St.Louis architecture, which I will announce in greater detail some time in the future. However, some recent work you may have seen is my piece called “City Stream” which was featured on the cover of Straight-Up Magazine’s December 2013 issue, along with a write-up about me and my photographic work. 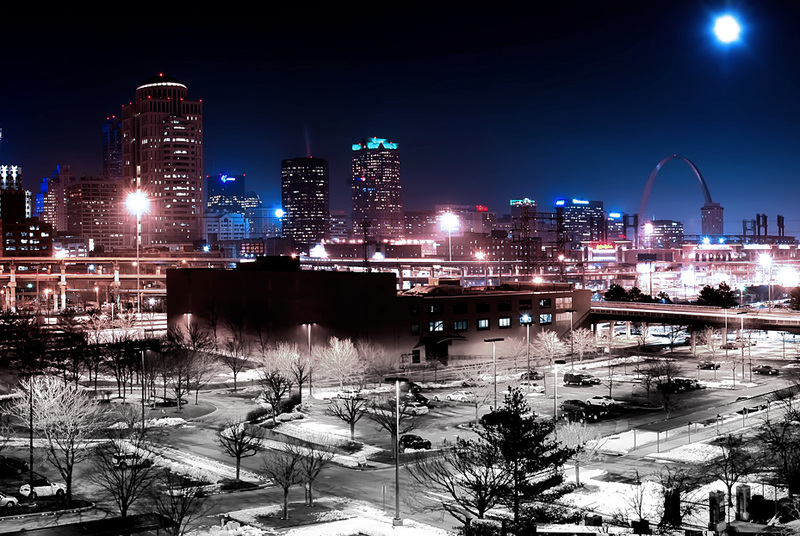 Another image that was recently captured was my 6-image panoramic piece of downtown St.Louis entitled, “Moon Over St.Louis.” This, arguably, may be my best work (so far). I thought about attempting this photographic capture since the first time I saw the view from the Blanke Building. All I can say is that this piece came out so much more captivating than I ever could have imagined, and the response has been overwhelming, for which I greatly appreciate. Part of the purpose of this post is to announce my active plans to launch a new e-Store for select pieces of my photographic artwork. This website will become the exclusive location online to purchase my framed or unframed artwork sometime within the next couple of months. I will be drawing to a close the other online locations offering my work in order to offer, directly, a higher quality product that represents my artistic creations more accurately. This e-store will also be offering the 2 pieces mentioned earlier in this post, “City Stream” & “Moon Over St.Louis.” Low-light photography is some of my favorite and most challenging subjects, and I want to bring it to all of you in the most magnificent form I can. If you’d like to be informed of; the opening of my new e-Store, announcements of new artwork, special editions, or upcoming exhibits, then use the form to the right and SUBSCRIBE to my Newsletter. It is now the best way to stay informed of what is coming in 2014. Thank-you!